Did you have to move houses when you were a kid? What did your parents do to make the transition easier on you? 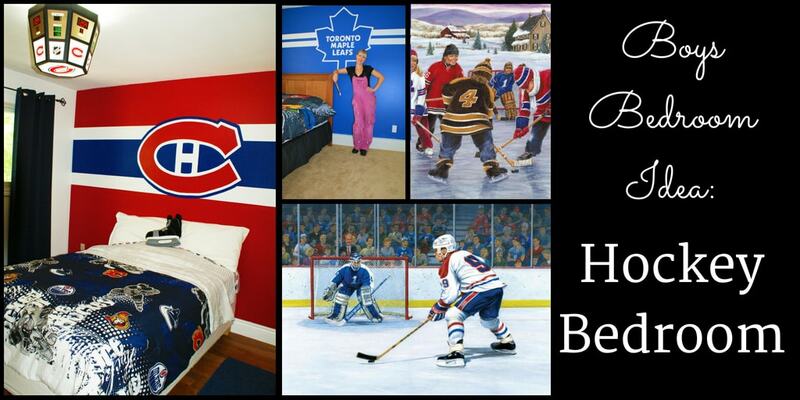 Nolin’s mom, Donna, decided to redecorate his room into a hockey bedroom when they first moved to Stoney Creek (from Oakville) to make him feel more at home. After chatting with Donna, we set up an in person consultation and I brought a bunch of hockey bedroom ideas with me. I put them together in this post for you so that you can get some inspiration if you’d like to make your own hockey bedroom. I sell wallpaper murals that ship for FREE all over the USA and Canada, and I have a few really cool hockey designs. They’re super easy to hang and totally removable. **Super sneaky tip (if you like these designs): keep your eyes peeled on my newsletter for when they come on sale…or for an extra hot coupon code! 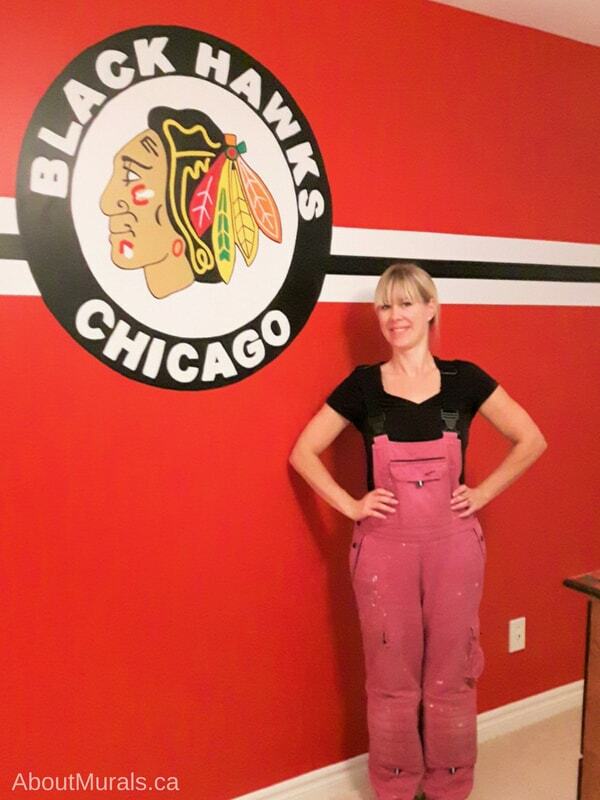 Donna loved the wallpaper but was leaning towards a hockey logo on Nolin’s wall, so I showed her my hand-painted hockey murals. I’ve been painting murals since 2005 all over Southern Ontario – and even got the chance to paint a mural for a Mike Holmes TV Show! 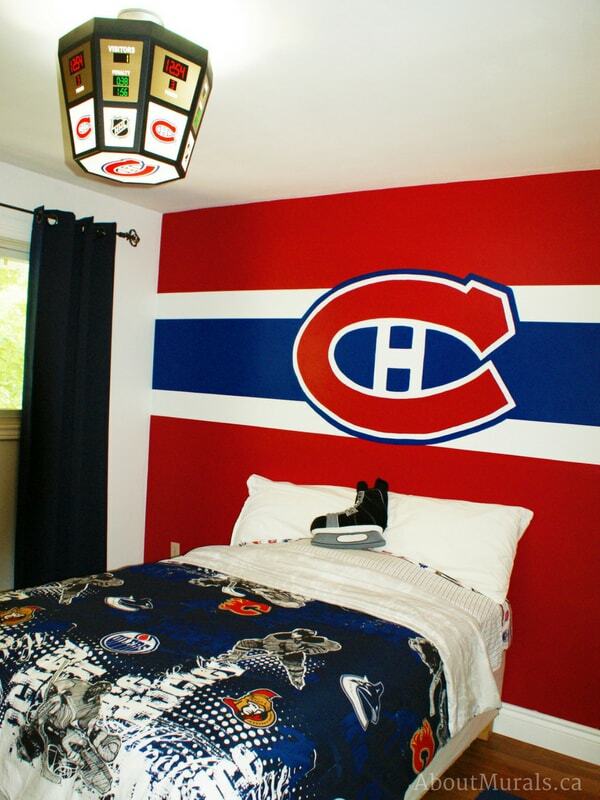 Since I had already painted some hockey logos, I brought photos of these hockey bedrooms for Donna to see. P.S. if you love these hand-painted team logos, get in touch for a quote. They start at $350 and I paint anywhere within driving distance of Hamilton, Ontario. 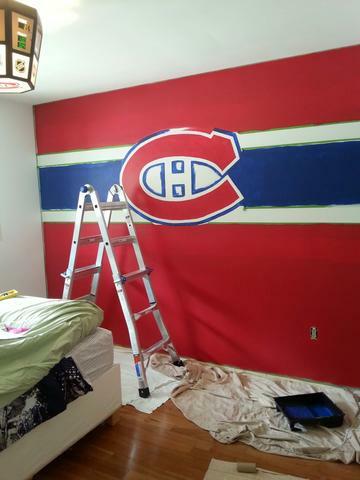 Nolin fell in LOVE with the hand-painted hockey logos, and wanted his fave team painted – the Montreal Canadiens. 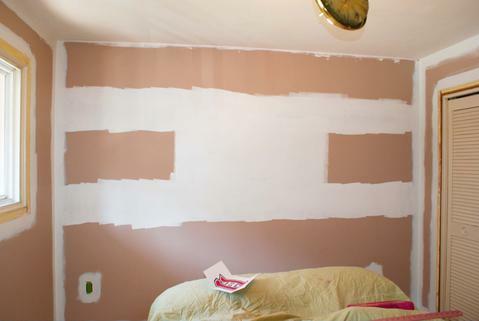 This is what his room looked like once it was all painted and put back together. How can I help you get your own hockey bedroom? Buy wallpaper! I sell cool sports themed wallpaper murals that ship for free in the USA and Canada. Hire me! I hand-paint murals in Southern Ontario. Get in touch for a free quote. DIY! 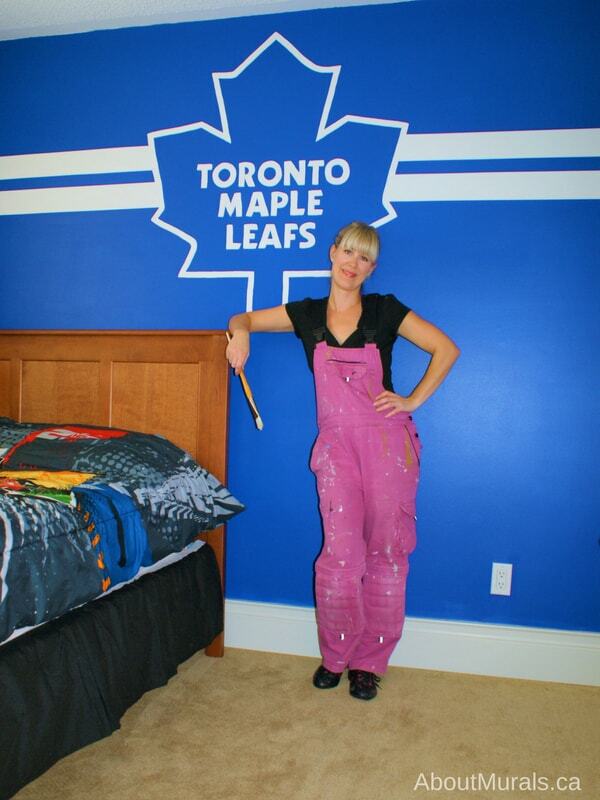 If you’d like to paint your own mural, keep scrolling to see how I created Nolin’s hockey bedroom. I’d love to see your handy-work when you’re all done – remember to tag me in your social media! 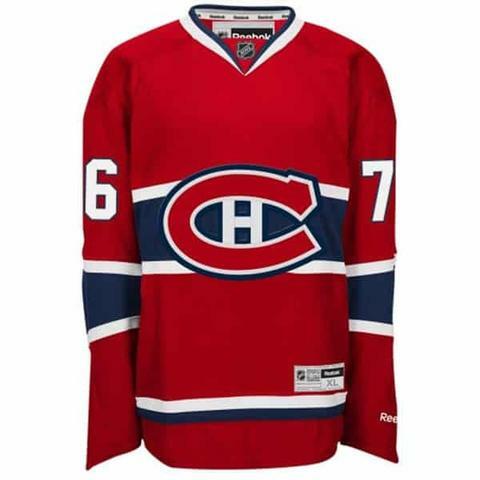 Once Nolin decided on the Habs logo, we had to hammer out the design idea. 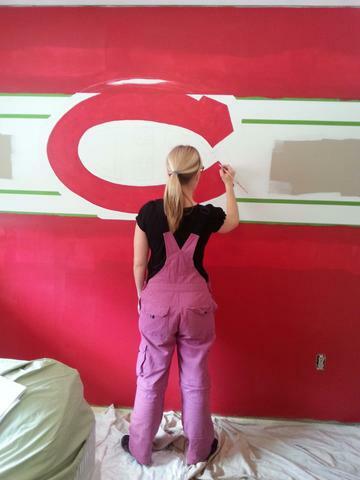 Since three walls would be painted in white, Donna and Nolin thought a red feature wall would look super cool. So we used the Home Jersey as inspiration for his mural. 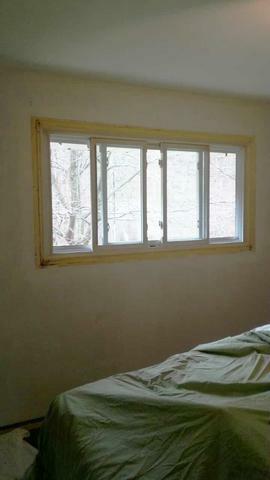 Here’s the “Before” shot of Nolin’s bedroom, before it was painted. 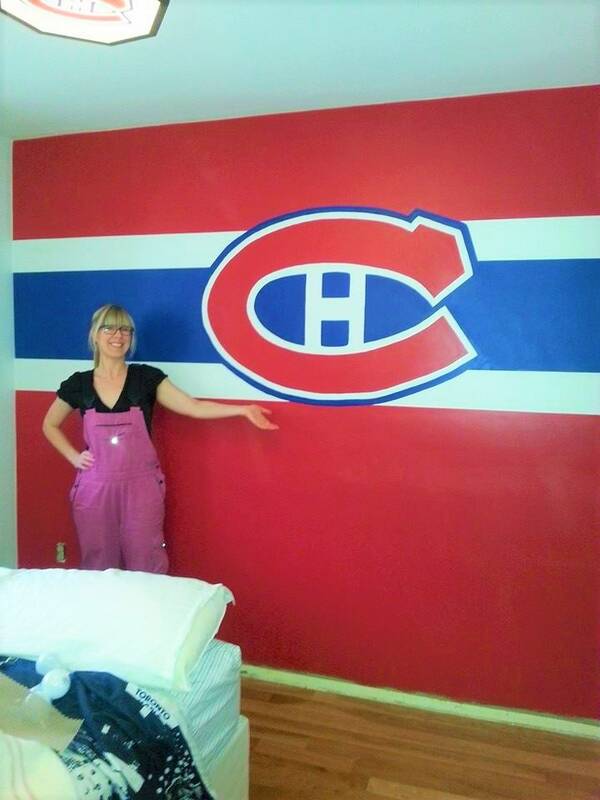 We choose Benjamin Moore Ice Mist (OC-67) for the white walls and the mural stripe in the Montreal Canadiens logo. Once I finished painting the base coat, I got to work free hand drawing the mural on the wall and adding the first coat of red paint. TIP: Anytime I paint red, I allow myself enough time (and enough paint) to do about 4 coats…or more. Coverage in red paint isn’t very good (usually yellow and green paint too). I added green painter’s tape for the horizontal lines. Check out my super sneaky tip to get really crisp paint lines. As I let one coat of red dry, I started to add the blue. I’d go back and forth between the red and blue as each one dried. 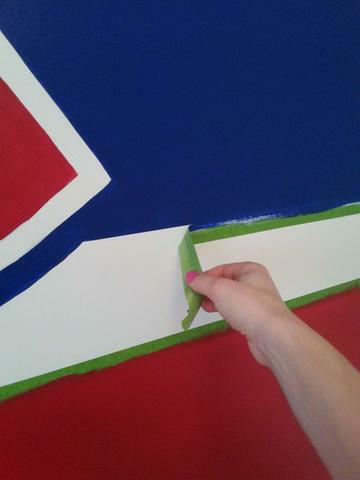 Then…my favourite part…peeling off the painters tape! It’s just like crossing something off a to-do list. Is there anyone else out there who gets a kick out of these things, or am I alone? Ta-da! 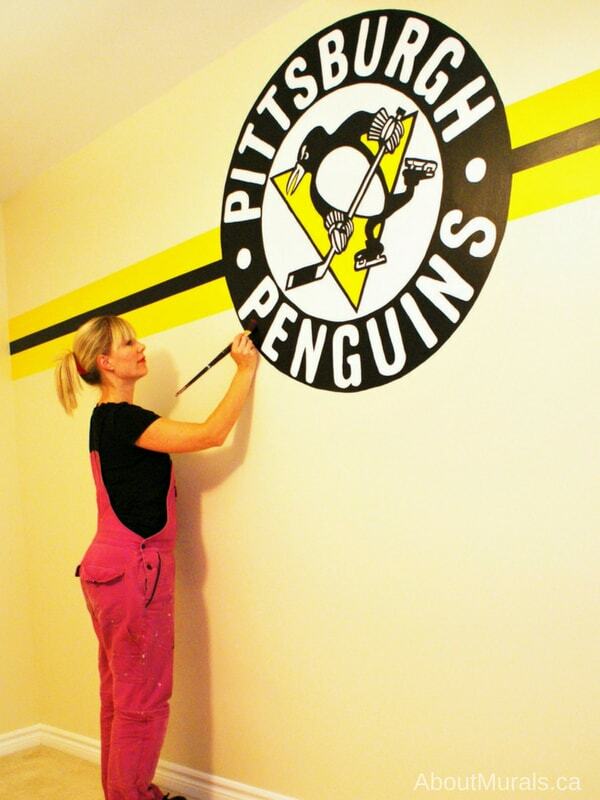 A fun hockey bedroom painted (that’s also perfect for a man cave, basement bar, pub or home office). Want more mural inspiration? Maybe some DIY tips? I’d love if you join my newsletter community! Did you try this mural yourself? Tag me on social media so I can see it! Follow me on Facebook and Instagram.